Born in Boston, Brian discovered both yoga asana and sitting meditation in his early 20s, and has been practicing both ever since. Brian first moved to LA in 2003. And his very first yoga class in LA was at the Power Yoga West Studio. In 2007 Brian sat the 10-day Silent Vipassana in Chennai, India. After that he immediately began teaching yoga to children at a Primary School outside Pondicherry. After five months in India, he returned home to teach children’s yoga as a volunteer in Santa Monica. 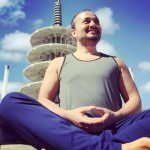 Besides meditation, Brian is a certified yoga teacher and a practitioner of evolved-NLP. He also runs an Investment Fund and credits his meditation practice as the primary driver of it’s success. His main influences are Bryan Kest, Saul David Raye, Shiva Rea, Govindas, Steve Ross and far too many great teachers to mention. He is beyond stoked to be sitting with you and back home at Santa Monica Power Yoga. Zen principles in plain English. In this practice, we’ll create some internal space and begin to retain autonomy over our focus and attention. Grab a comfortable seat and let’s begin.